Tackling a boardroom makeover project? You're in the right place! Today on the blog we'll highlight the tips, product suggestions, and ideas needed to rock your remodel. From proper space planning to effective installation, this post is a must read for any business looking to take their boardroom to the next level. Before you rush out and purchase new office furniture for your boardroom, take the time to properly measure your space. There's nothing worse than investing in all new furniture, only to find that it doesn't fit upon arrival. When measuring out your interior, be sure to take note of all the power outlets, windows, doorways, and room obstructions that will affect the way your furniture is situated. Take your time on this step. It lays the foundation for a successful remodel. Once you've got you know what's going to fit, it's time to set a budget. Do a little research online to determine the items you'd like to incorporate and how much they cost. Below we've listed a few popular lines that offer everything needed to design a functional boardroom that's up to date with the latest trends. It's always a good idea to order finish samples before purchasing new furniture. The swatches you see online always tend to look slightly different in person. The good news is, finish samples are free and ship quick. Many of the headaches associated with office remodeling projects revolve around unrealistic timelines for completion. You should plan for the process to take 2 to 3 weeks from start to finish. The space planning, budgeting, and finish sample ordering steps should take about a week. Once complete it's time to shop and get your products ordered. If you purchase in-stock products, they should arrive within 5 to 7 business days. The installation process should only take another day or two. 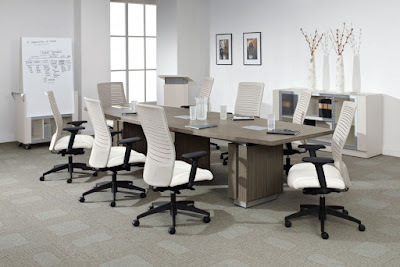 Alternatively, if you purchase custom boardroom furniture for your business, your timeline will be extended. Plan accordingly. All too often, furniture shoppers over-purchase. This commonly results in overcrowded interiors that can't perform at a high level. It's best to focus on priority items, then re-evaluate once they've been installed. We highly recommend selecting furniture from a full service collection. If you purchase a boardroom table from one manufacturer, chairs from another, and accents from a third, things can get a bit tricky. Right out of the gate you'll have to prepare for 3 separate deliveries! This can be avoided if you source your products from a single manufacturer and furniture dealer. Below are a list of companies that have everything you need for your remodel. There's tons of great ways to maximize your boardroom remodeling budget. From free shipping to bulk discount pricing, don't miss out on the chance to save by not doing your homework. Once you've ordered the components for your boardroom, contact your dealer direct to inquire about estimated ship-times and tracking information. This should be provided, but it never hurts to call. Approximately 3 days before your new furniture arrives, clear out your space. Now is the perfect time to patch up any unsightly wall scuffs and lay on a fresh coat of paint. Those who try to install furniture and then paint around it typically regret it! Office furniture assembly is pretty simple, especially when it comes to boardroom components. Most table tops attach easily to bases and can be fully assembled in less than 30 minutes with a two-person team. Wall cabinets and presentation boards usually ship assembled and just have to be unboxed. You'll likely spend the most time assembling your boardroom chairs as there will be several of them. The first one will take about 30 minutes, but once you've figured out the process it's nothing to be afraid of. If you feel like installation will be too much to handle, call the pros and get a quotation. This will require a bit of scheduling, but for larger projects it might be necessary. With your table and chairs fully installed, you're probably looking for ways to take your interior to the next level. Rest assured, there's plenty of options. Check out the list below! With your space complete, give it a trial run! Vacuum the floors and clean your furniture to ensure it's looking spiffy. Make sure your conference table power options are working correctly. Ensure your chairs are operating properly and set to a comfortable height. Stock your wall cabinet with the stationary needed to conduct an effective meeting. Once you're ready, host a casual meeting to test out the functionality of your space and get feedback from your coworkers. The odds are, you've just completed a boardroom remodel that you can be proud of.